...this summer as the 'Summer of Spinning' here at Chez Obsession. It's not that there won't be any knitting -- ha, as if! There's a whole series of sock experiments going on, so I guess you could actually call it the 'Summer of Spinning & Socks'. At any rate, the focus will very much be on fiber, fiber prep, spinning, etc. Why? Because I am drowning in fiber and fleeces here! Mind you, I'm not in any way complaining (truthfully, it makes me embarrassingly giddy), just stating a fact. I think we've proven that I can stockpile wool pretty much anything fiber. Now it's time to see if I can actually DO something with it. In the next few days I'm going to put together an inventory and get it listed here so that there's nowhere to run. Remember the Spinner's Hill Hot Rod? Fresh singles showing a good full range of Lisa's colors. 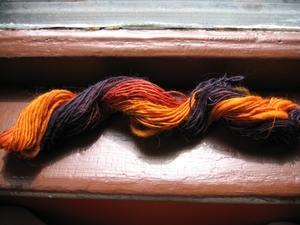 And here's the rest of the test spin, Navajo plied. Verdict: It's a little annoyingly sticky on the draft, and maybe it's a fiber best spun sober (what? just let it be a leson to you, that's all I'm saying), but it has a very lovely sheen and drape and seems like it would knit up into a lovely fabric. In general, I also tend to like richer, deeper colors than I normally see in this blend. 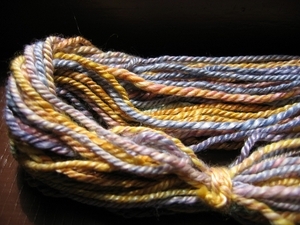 Is that just current dyeing fashion for this stuff, or is there something about the fiber properties of the tencel that makes it harder to get the rich colors? Anyone? Too funny! I can't wait to see the inventory. It can only make me and my new huge plastic bins feel better. Maybe. maybe that's my problem. next time i try to spin, i drink. Look at that lovely newly-born yarn. The Summer of Spinning: beats lace this year IMHO: Let's get a button! Ooooh! That Hot Rod is hot stuff indeed! And your spinning is lovely--it looks so nice and even!